We are a quilt design studio specializing in longarm quilting, quilt restoration, and t-shirt quilts. So Long, 2012 … Hello 2013! Happy New Year’s Eve everyone! What are everyone’s big plans for tonight? We’re staying in and sipping on some of our favorite wine until the Big Ball drops … it’s nice to go out, but sometimes it’s even nicer to stay in! What an amazing year 2012 has been, and I’m looking forward to 2013! There have been so many changes in my life over the past year (for the good), but a lot of life lessons along the way. Today’s post is a bit more personal, so please bear with me. I have always tried to play it safe, went to college, got my graduate degree, worked at jobs with guaranteed paychecks, but I was never totally happy … my mind was always somewhere else. I taught elementary art for a year and thought that was about the best job since sliced bread. I loved working with kids, but I especially loved being involved with art, my passion had been rekindled. If only I could make it into a viable living! Well this summer I took the biggest leap of my life, pooled all of my money, and started my business. I absolutely love owning my own business. Things have started slow, this summer I had to work at just getting my patterns ready, getting my website designed and learning to long arm quilt, but things continue to pick up. I have learned that the Internet is great, but there’s still no substitution for good old face-to-face networking! In 2013 I hope to do some shows, join guilds and continue teaching to help with that. There have definitely been times when I have thrown my arms up in the air and wanted to call it quits, but those days are fewer and more far between than the days that I am totally enveloped in what I’m doing. More than anything what I’m doing just feels right, and I have never had that feeling with anything else I’ve pursued. Exercise more – in the past year I have gotten really good about taking daily walks, but I’d like to mix things up a bit and work on getting more toned. Three is a good number, don’t you think? Wishing you a Safe and Happy New Year! 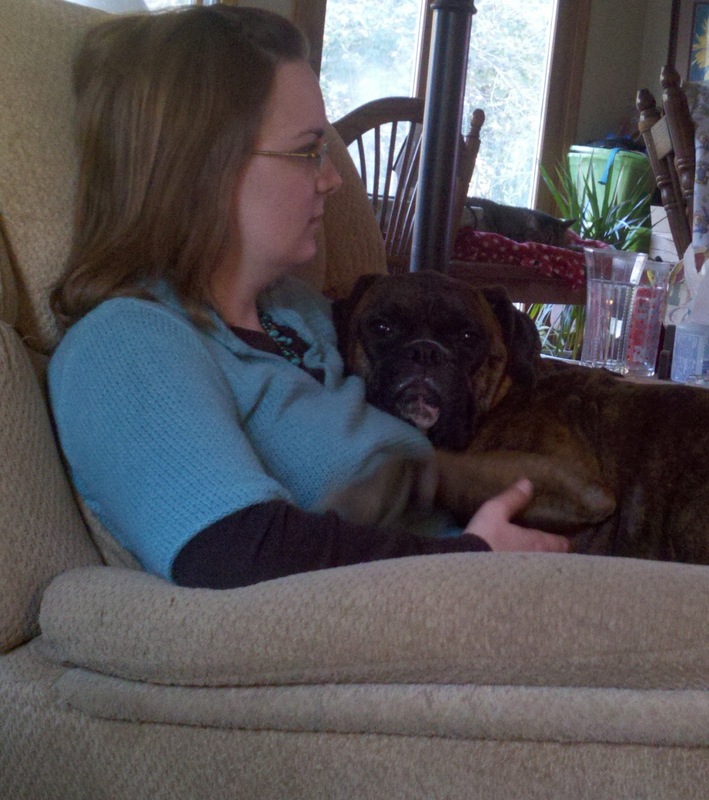 For today’s final post of our “Comfort & Joy” series, I have a special guest, my mom. (You can expect to see more from her in 2013, yay!) Each year she makes this special “scrapbook” to hold onto our most treasured holiday cards, but it could be used for photos or for cards received all year round that you want to hold on to. P.S. Be sure to check back on the 1st and 5th next week for special blog posts! For years, we have recycled our Christmas cards and those we have wanted to save, we have put in a box. 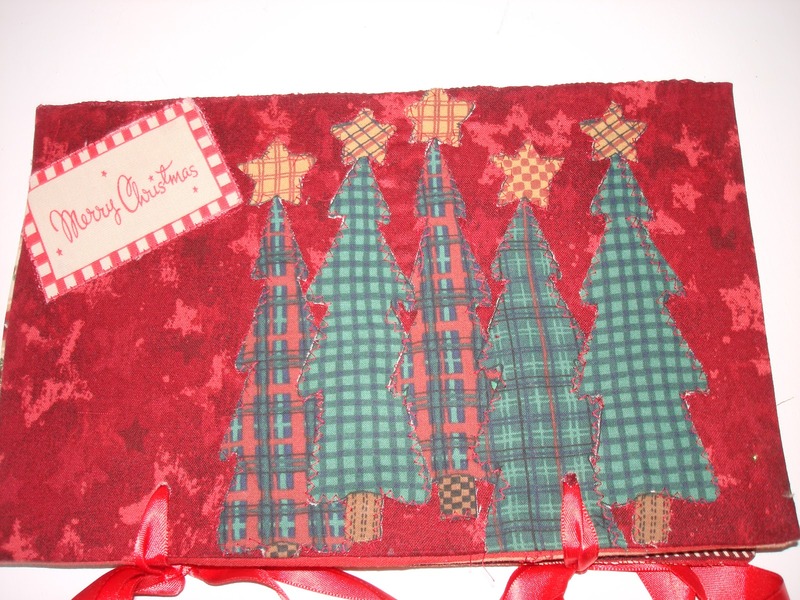 I decided several years ago to do something a little different … I created a Christmas Card Keepsake album … somewhere to store each year’s cards, pictures and letters in a more organized manner. 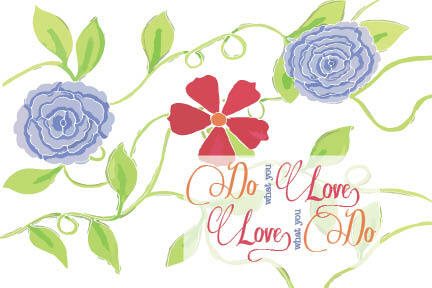 This way, the album can be put out each Christmas for all to enjoy along with the new cards, letters and pictures. This is a great project to get the entire family involved in or to just enjoy doing yourself! 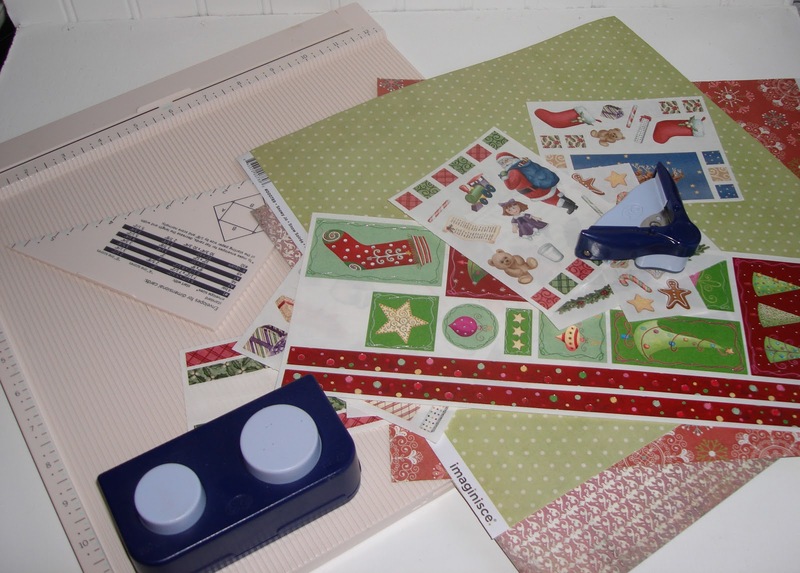 You can use either scrapbooking paper or fabric. Last year, I chose scrapbooking materials as you can see below but this year, I decided to change it up a bit and use fabric. 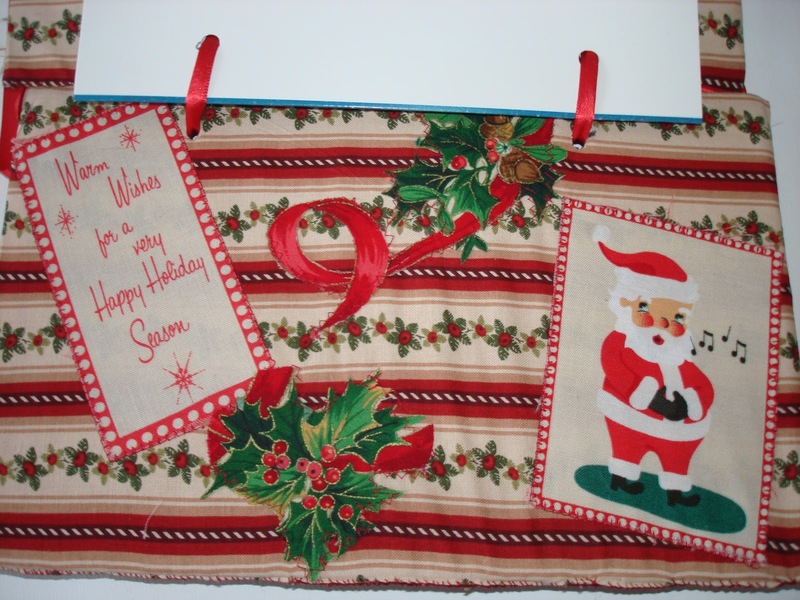 This is a great project to use your scrap fabric for! No matter which you choose, the method is still basically the same although one uses glue exclusively and the other you will need a sewing machine or needle and thread to complete. The first thing you will need to do is measure your largest card and then cut two pieces of cardboard so that your front and back cover will encase your cards. Cut the cardboard to that size … mine was 6 1/2″ by 10 1/2″. Then take your fabric and cut it so that it is an inch larger horizontally and a 1/2 inch larger vertically … so my fabric was cut 7 1/2″ by 11″. You will want to put any embellishments on before stitching your front pieces of fabric to your back pieces of fabric. For this year’s album, I fussy cut fabric and then appliquéd them to the front and back covers, both outside and inside … you can do as much or as little as you want … make it your own! The one thing that I always do is put the year on the front cover. After embellishing your fabric, put the right sides together for the front and back covers and sew the top and bottom and one of the sides together … you will do this twice … once with the fabric for the front of your album and once for the back of your album. Turn your sewn pieces so the right sides are on the outside. Iron your covers. Next, slip the pieces of cardboard in between your sewn covers. 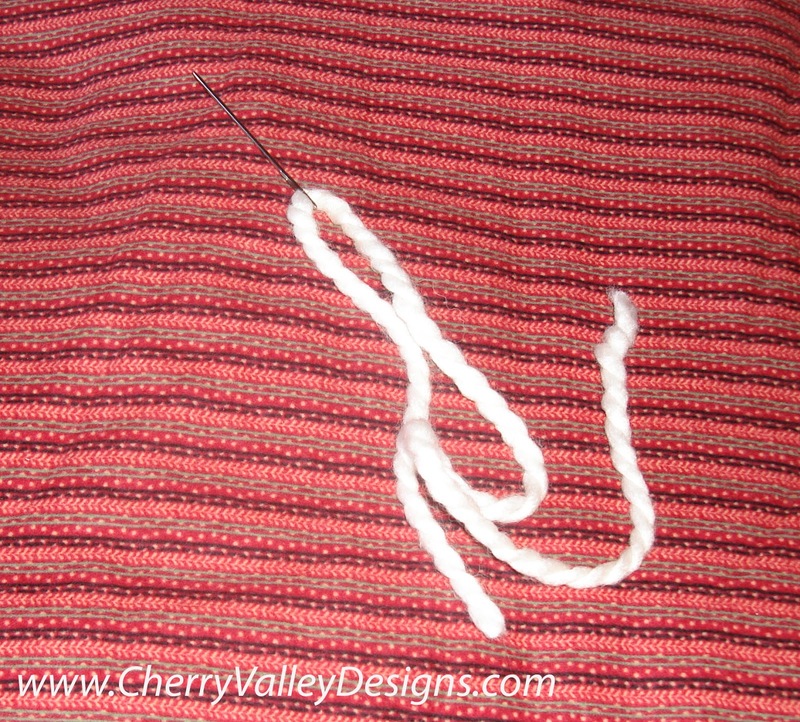 Fold the open end of your fabric in and slip stitch the opening so it is closed … again, you will need to do this twice. 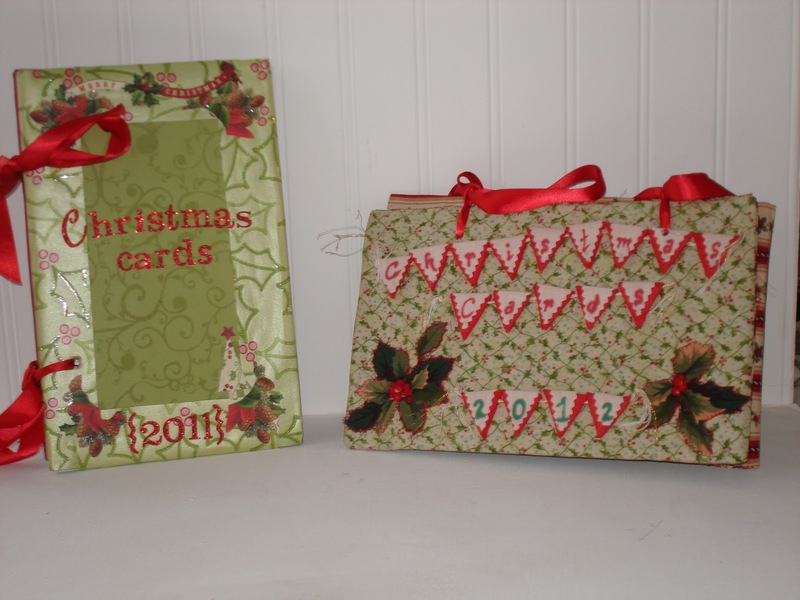 Take your largest Christmas card and decide where you want it to sit in your album. Mark your cover pieces and then using a Crocodile heavy duty punch and punch two holes in both the front and back covers. 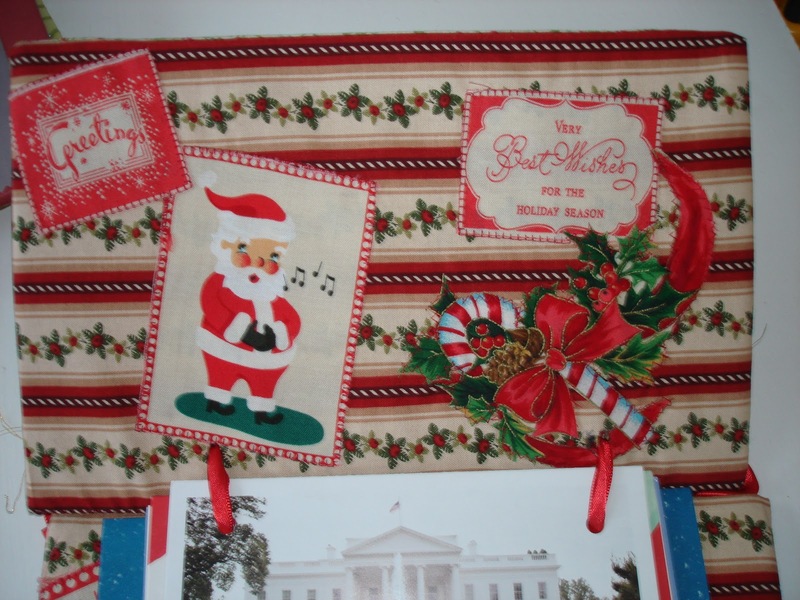 Punch holes in each one of your cards, thread a ribbon through the cover holes and card holes and tie the ribbon at the top … there you have your Christmas Card Keepsake Album to enjoy for years to come! I hope you had fun making this project and that you and your family will enjoy it for years to come! Merry Christmas Eve everyone! It’s hard to believe it’s already Day 5 of “Comfort & Joy.” I hope you all had a wonderful weekend and are ready for this week’s festivities. 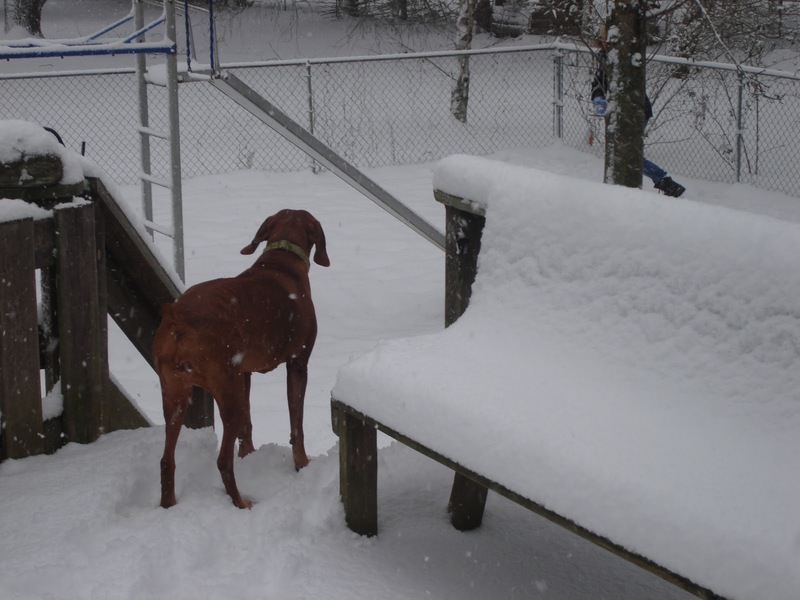 We spent the weekend playing in the snow and buying groceries for our “big” meal preparations. 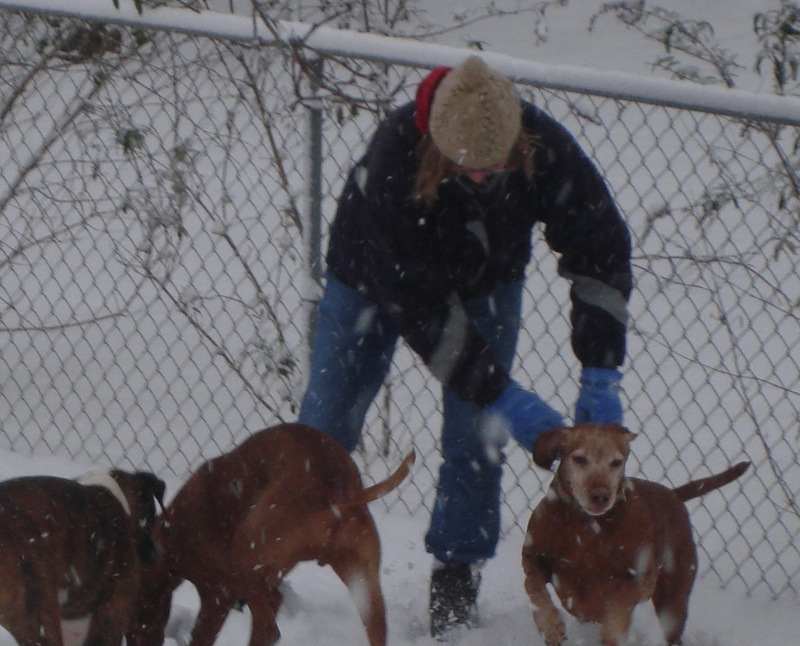 You can see more of our romping in the snow here. We love quotes, and each year we like to have a quote that serves as our inspiration for the year. 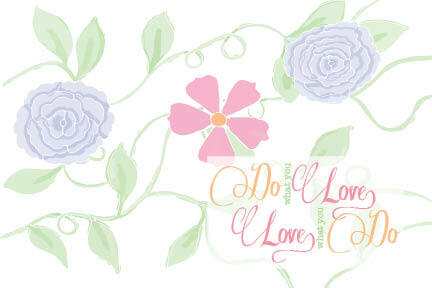 For 2013 our quote is, “Do what you love. 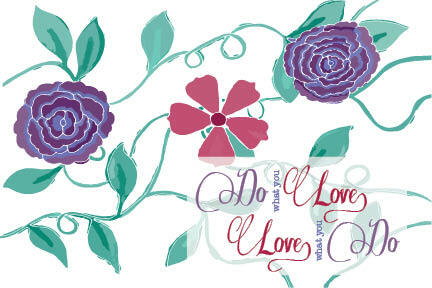 Love what you do.” We’ve created a print in three colorways that we are sharing with you today! There are two size options (4″x6″ and 8.5″x11″). You can download each of them underneath the pictures below. Happy Saturday Everyone! I don’t usually post on Saturdays, but today is an exception. 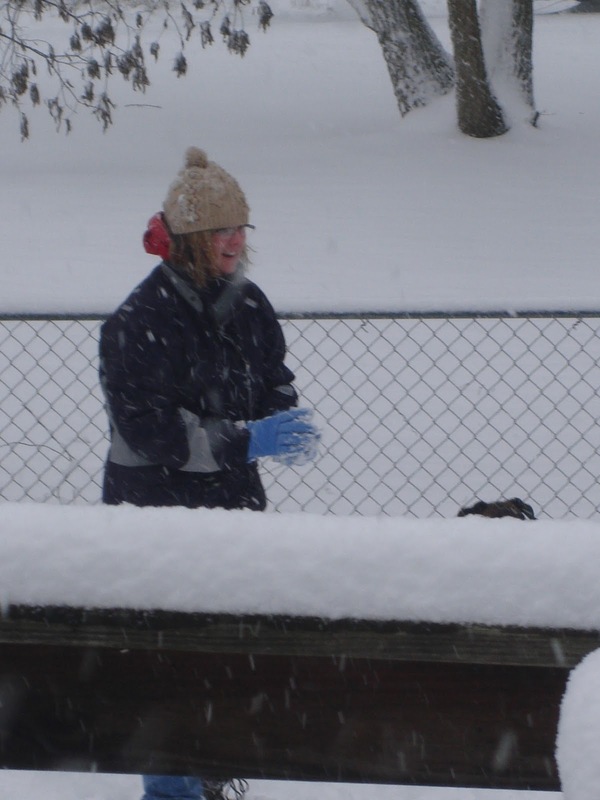 Yesterday we had quite a bit of snow and I’m one of those people who L-O-V-E snow! Is anyone else out there like me? 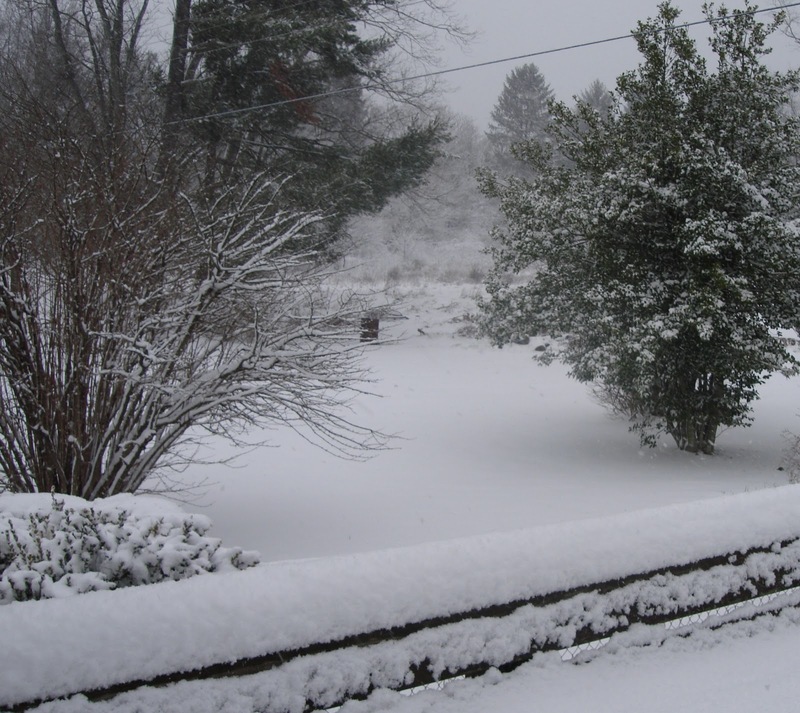 We haven’t had one bit of snow here in central Ohio and everyone’s been complaining that it just doesn’t feel like Christmas, but we got it just in the nick of time! 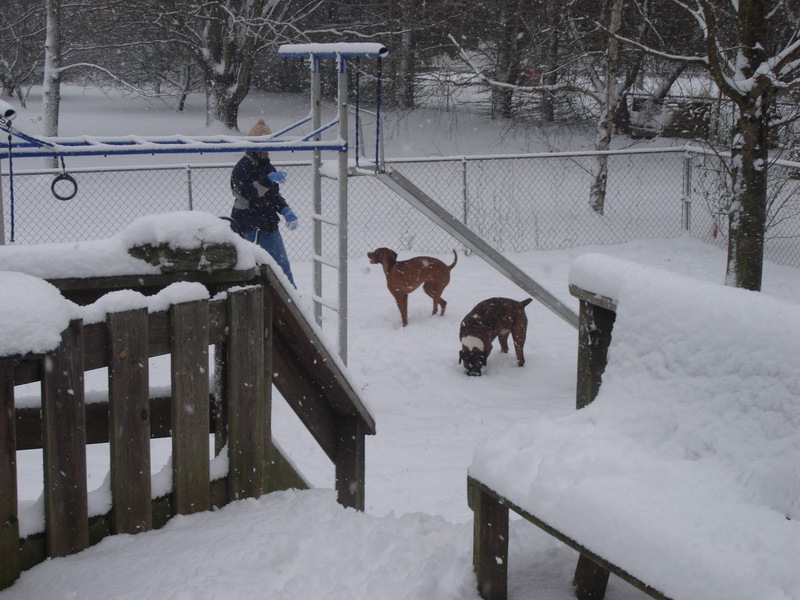 Izzie and Brinkley really got into catching snowballs, does anyone else’s dogs do this? It was hilarious! They loved chomping down on the fresh snow. In addition this week I’ve gotten three big things crossed off my “To Do” list and feel so much better. I finally feel like I’m ready for 2013 and to move onto new patterns! Yay! One of the things is that we now have are PDF versions of all of our patterns available on our website! This means as soon as you order one of these patterns they will be delivered to your e-mail and there is no waiting for shipping! Be sure to check it out here! I’d like to start this post first by saying how myself along with my family were just devastated by Friday’s events. There truly are no words to comfort those affected by this senseless act of violence on our country’s most innocent – our children. To think that it is less than ten days until Christmas and there are packages under trees that will never be opened simply breaks our hearts. Our thoughts and prayers go out to the community of Newtown, the families in grief, and to all those across our country that have been affected by gun violence. One of the things I cherish about quilts is the memories they evoke. They are more than just practical and decorative. They offer insight into the creativity and style of the person who made it – a little piece of who they are or were. Quilts can also remind us of who the quilts were made for and each time we wrap ourselves in them it is as though the person it belonged to and/or made it is giving us a big hug. In a word quilts can be therapeutic … Just a thought. 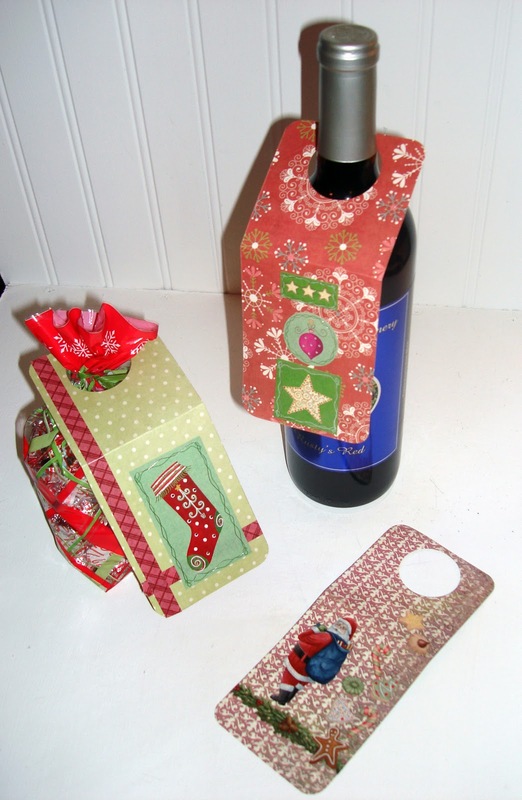 During this time we could all use a little “Comfort and Joy” and today’s projects are three fun, relatively easy gift tags. As you will see there are a variety of packages these can be used on and two of the three can be reused for decorative purposes. First up, there is the tree ornament. 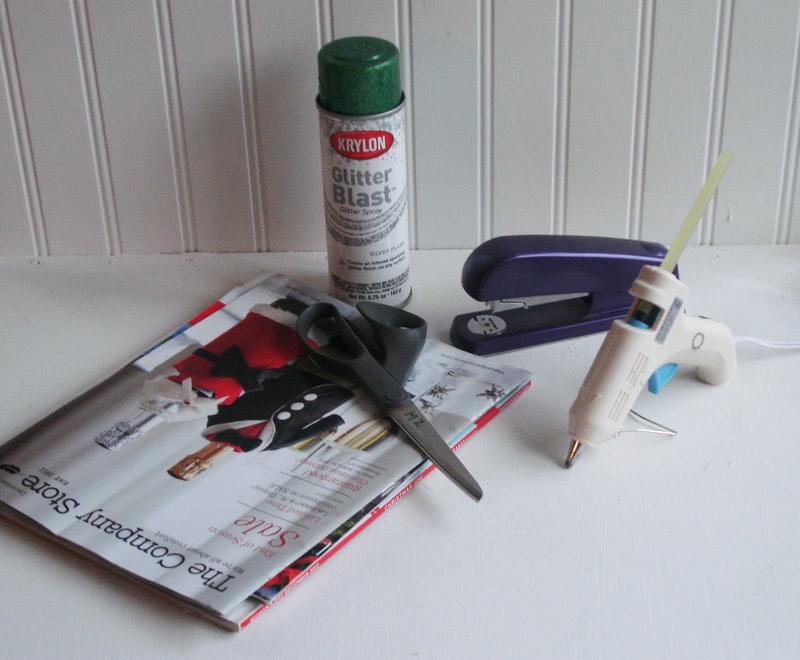 What I love about this project is that in addition to its beauty, it is also “upcycled.” You can reuse paper from a catalog or magazine – whatever you have on hand – to make it! 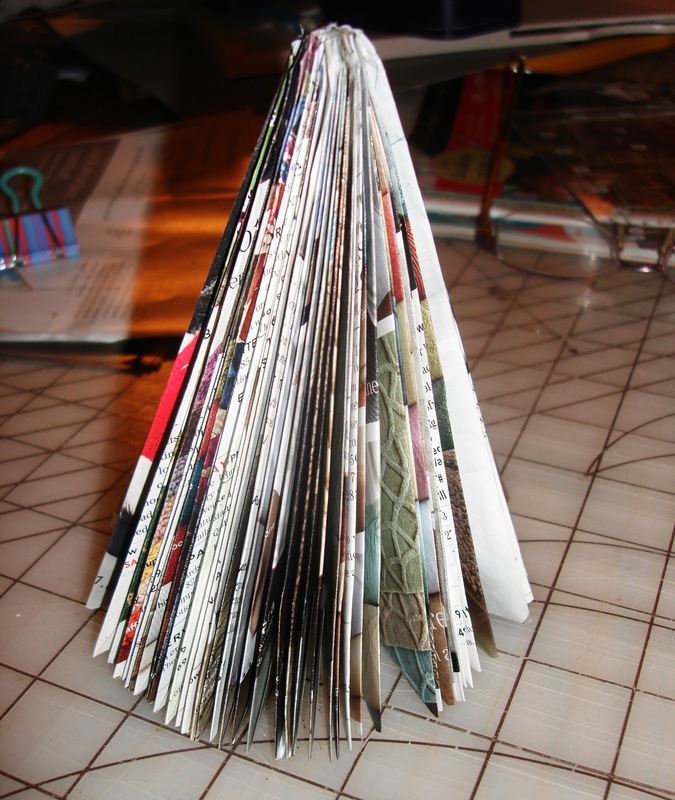 Step 1: Take out existing staples from the magazine, and cut the magazine in half so all pages are approximately 8.5″ by 11″. Step 2: Cut pages in half horizontally and fold to form a “small” booklet. Staple in middle. You will want between 30 and 40 pages to create a full tree. Step 3: Begin folding pages toward seam and fold over towards seam once more. Follow by folding the sharp edge pointing down up to create a straight edge along the bottom. Step 4: Once you complete your tree it should look like this. Step 5: Take your tree to a well ventilated area and spray with your chosen spray paint. Let dry completely (overnight is best). 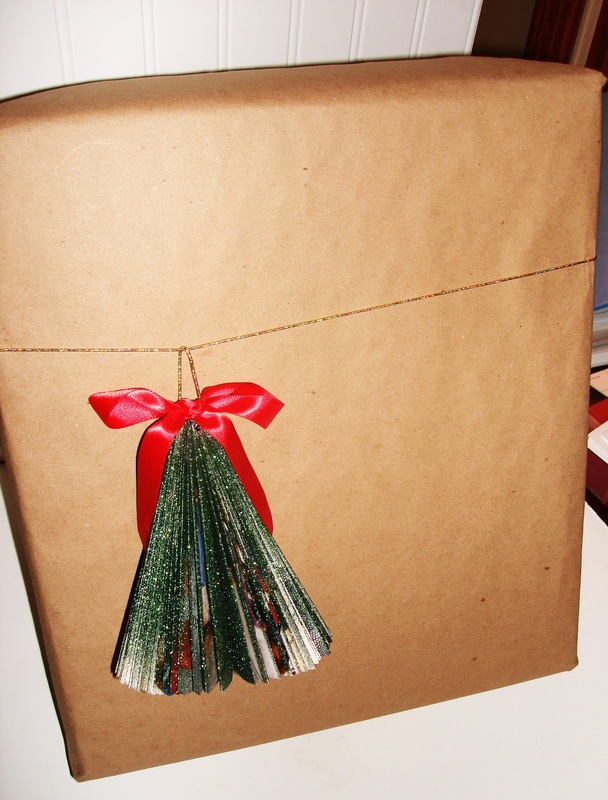 Step 6: Tie a ribbon and loop a cord. 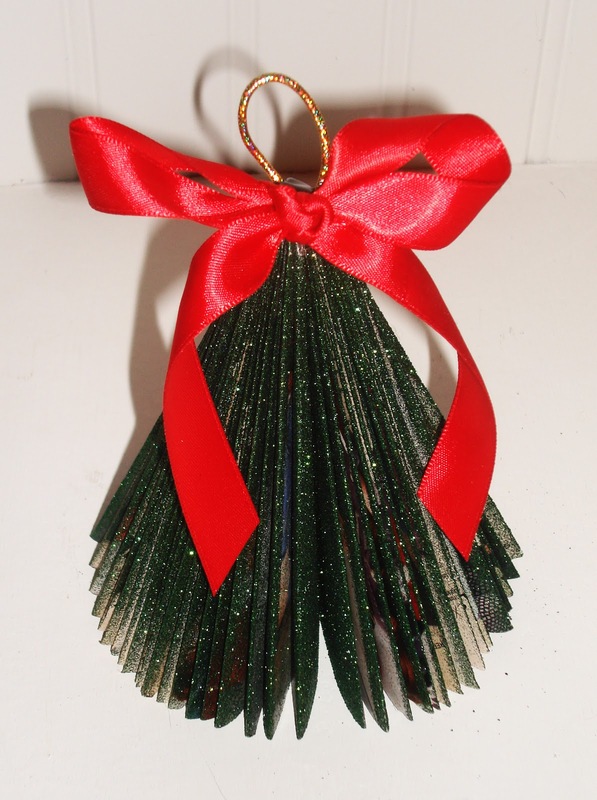 Using a hot glue gun attach the cord and ribbon to the top of your tree. 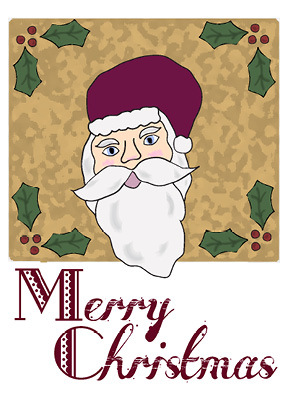 Your gift tag/ornament is complete! Step 1: Cut out a 6″ square from the piece of paper. 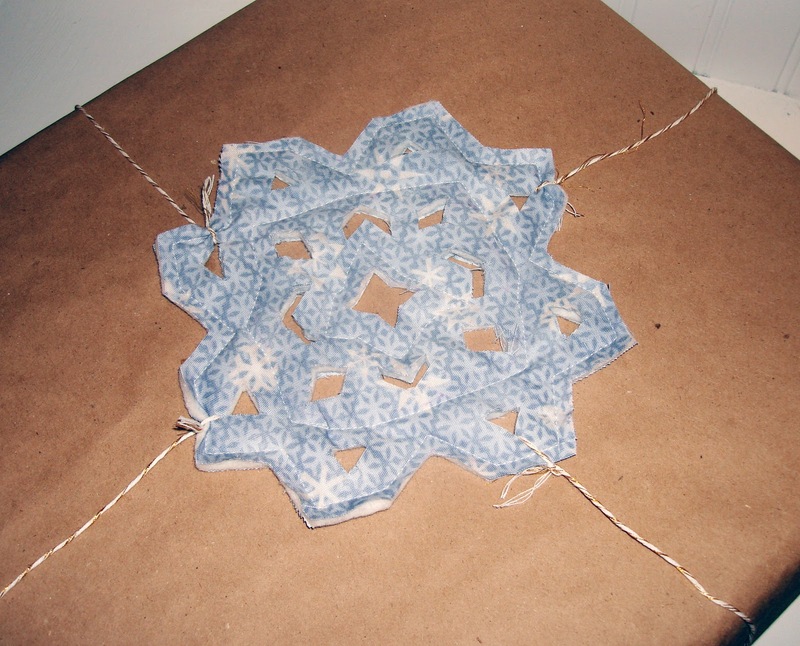 Fold over 3 times and cut out a snowflake. Remember to make relatively large holes as you will be cutting these out in the fabric! 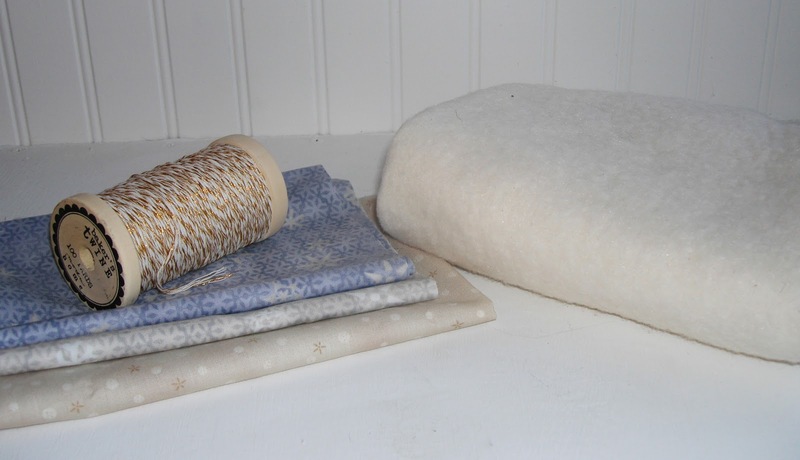 Step 2: Make a sandwich of fabric – batting – fabric with the fabric’s right sides facing out. 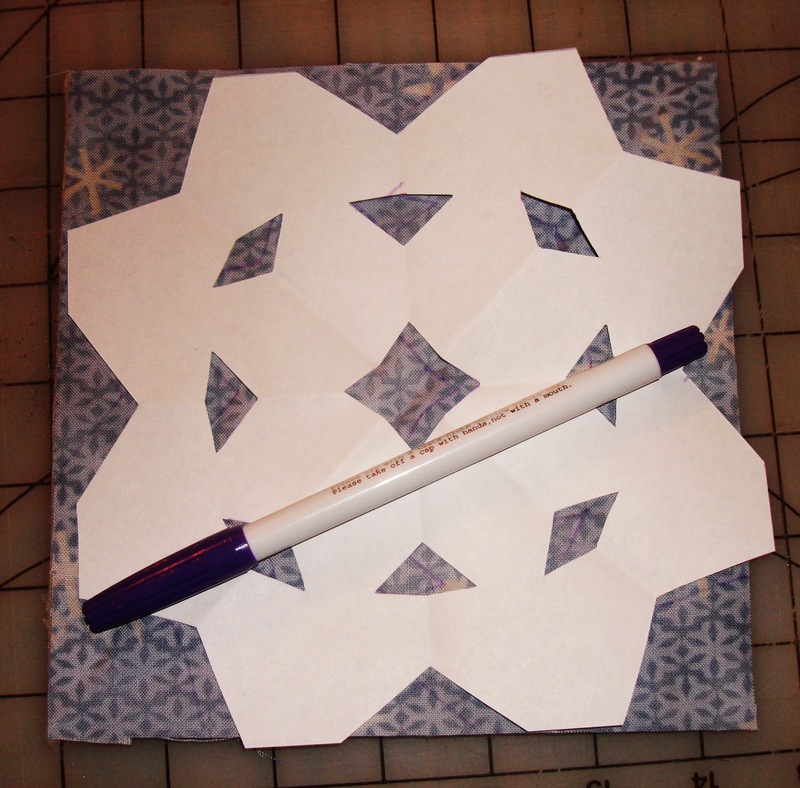 Step 3: Using a fabric marking pen, mark the fabric using your paper snowflake as the template. 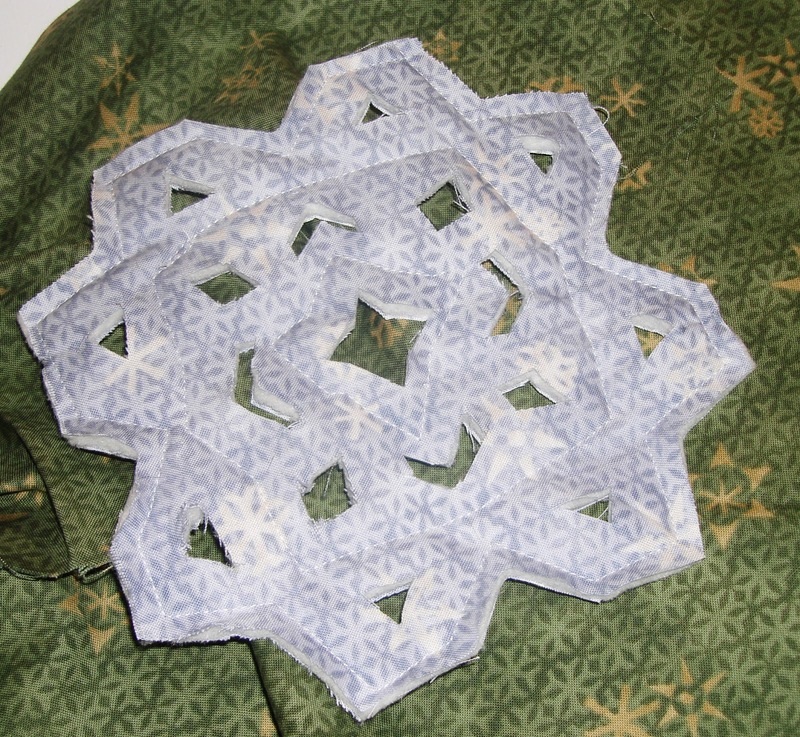 Step 4: Sew along edges of the snowflake’s design and cut out around sides and holes. Your snowflake is complete! Simply secure to package. For any of you scrapbookers out there, pull your goodies out because you’re going to need them for these gift tags! These will easily slide over a bottle of wine or any kind of goody bag you may want to make filled with candy, cookies or whatever else you can dream up. Step 1: Cut paper out into 3″ by 7″ rectangles. Trim edges decoratively, if so desired. Step 2: Using a scoring board, score the rectangles 3″ down going lengthwise. This will ease in folding the tag over the bottle/bag. Step 3: Decorate as desired and place on gifts! Easy as that! I hope that you enjoy making and using these tags on your gifts this year!! P.S. If you haven’t already done so, please take time to answer our poll on the top left hand side of this page … Thank you! Are you still looking for the perfect gift for special someone? Would you like that gift to be homemade? For the third day of our “Comfort & Joy” series we have a super-fast-to-make quilt that you can whip up in less than a day! The fabric I used is from my favorite quilt store and when I saw it I knew I just had to make a quilt out of it! When I got home I realized all the fabric was from Buggy Barn. You may remember Rose’s Palindrome which is also made from Buggy Barn fabric. Hmmm … I think I see a pattern. For small squares, cut out 15 squares from each of your four fabrics at 6-1/2″. 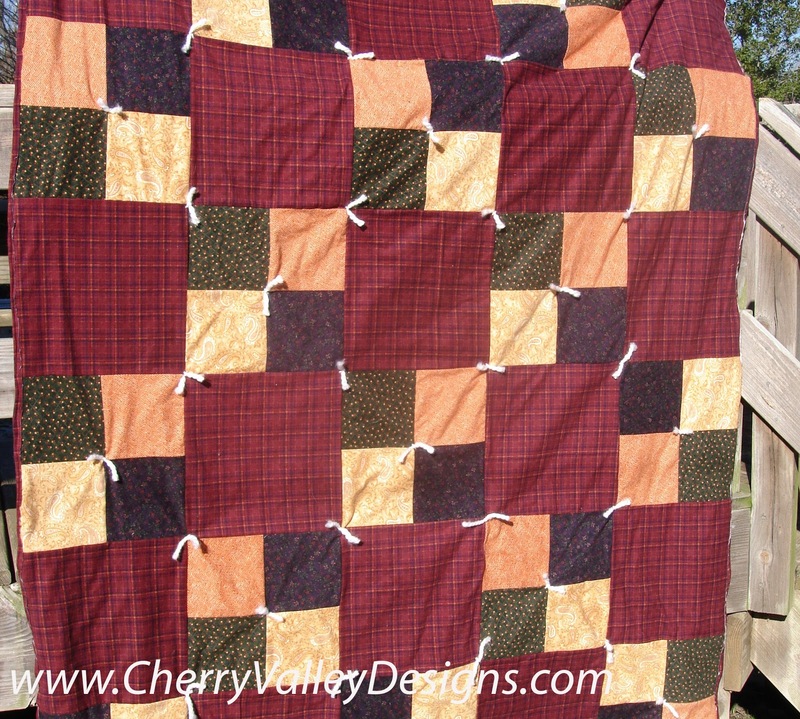 For large squares, cut out 15 squares from your one fabric at 12-1/2″. 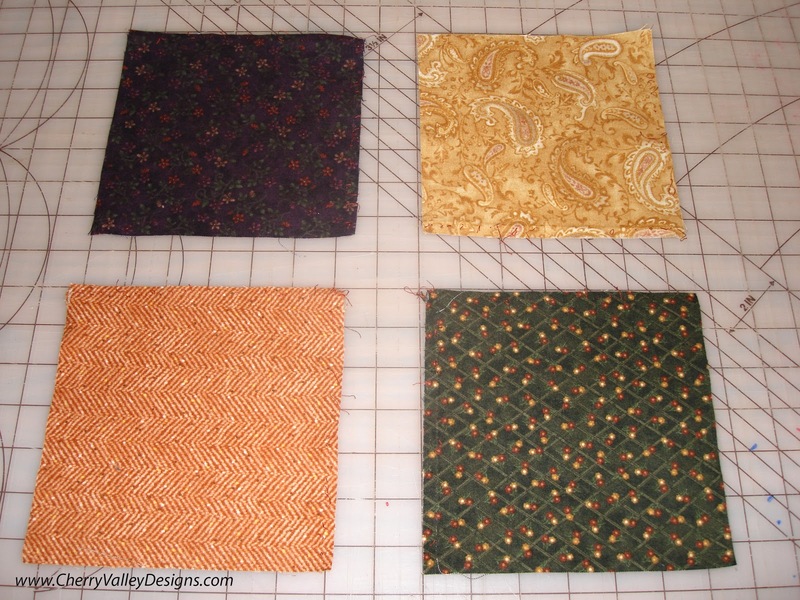 Sew four of the small squares (one of each color) together to create a 12-1/2″ square. Repeat until you have blocks. 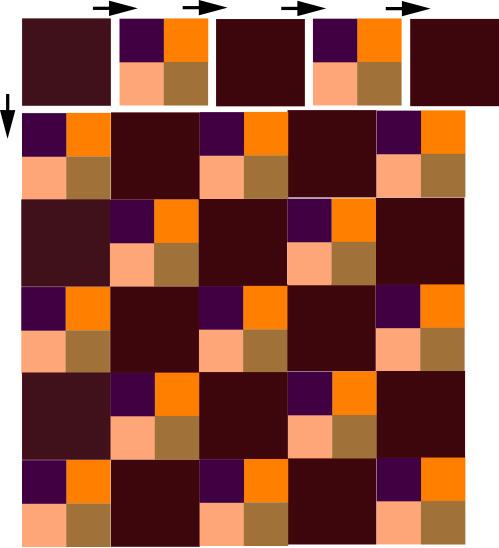 Use the diagram below to assemble your quilt. 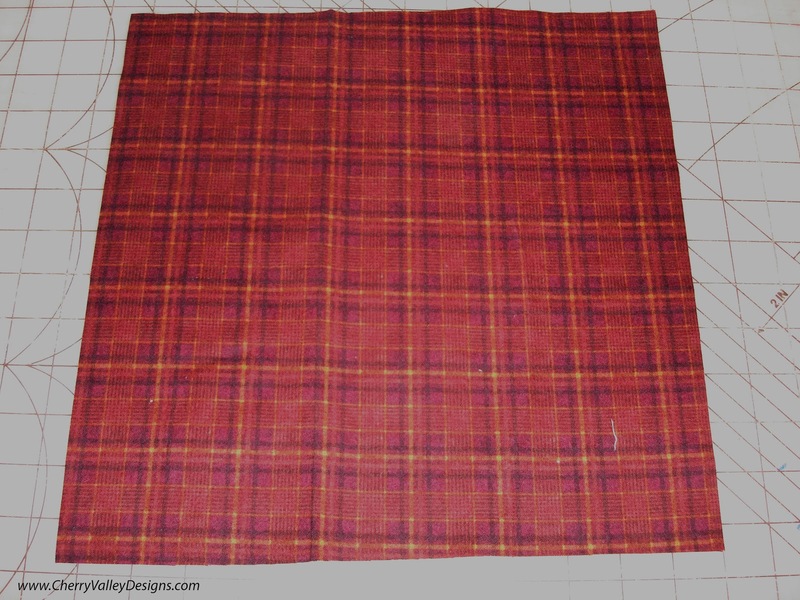 Cut and sew your 4 yards of backing fabric so you have a piece larger than 60″ by 75″. Assemble a quilt sandwich with your top, batting and backing. 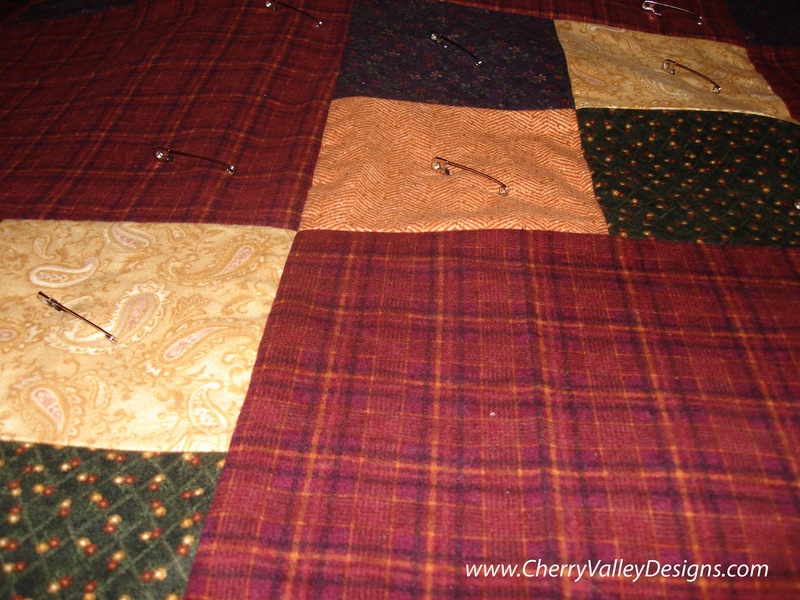 Next, using safety pins begin pinning your quilt sandwich approximately every six inches. Using a darning needle and your chosen yarn, begin making knots by going all the way through the quilt sandwich and back up. Put a yarn knot through each block’s corners except those on the outside edge (this is where your binding will be). Remove safety pins when you’re finished. Cut off excess batting and backing fabric. Cut your binding fabric into (7) 1″ strips and sew in a chain. Iron the strips in half lengthwise and then place fold over edge of quilt. 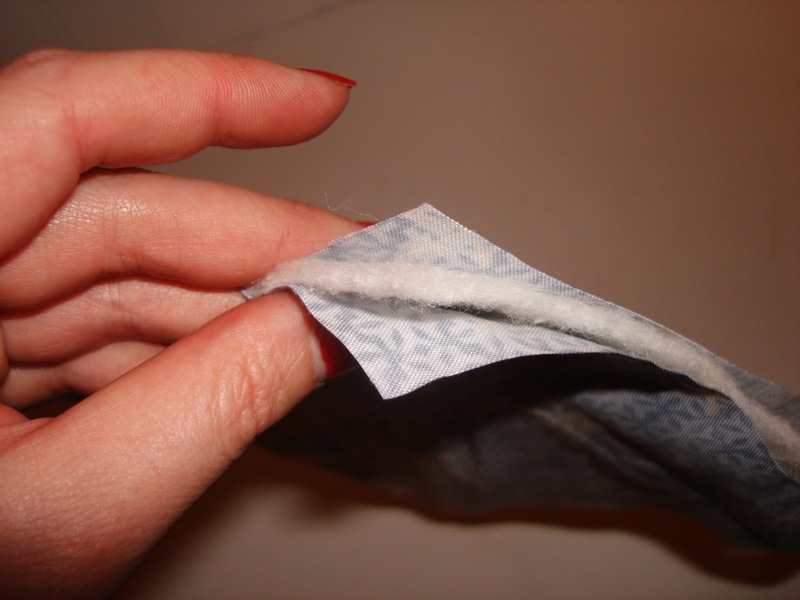 Sew a 1/4″ line down the side going through all layers of fabric. 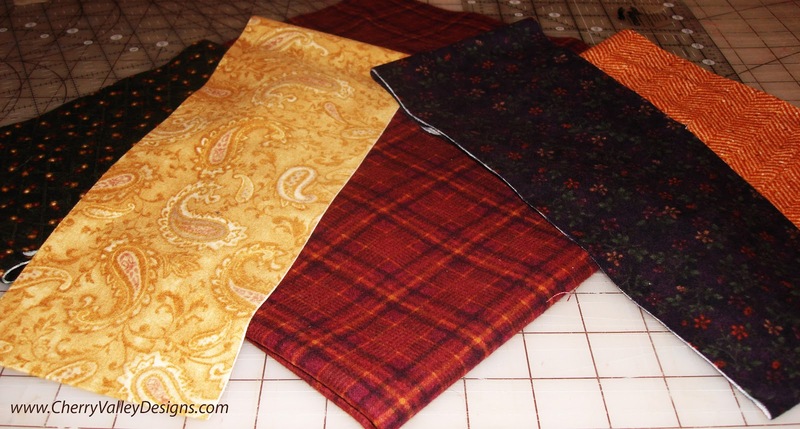 This will create a raw edged binding – adding to the quickness of this quilt! Step back and enjoy! Give to friend or family member! TGIFF – You’re in the Right Spot!